Fagus sylvatica 'Purpurea Pendula' is a small weeping Purple Beech tree. Unlike most other Fagus, this variety will grow to a height and spread of only 3 x 3 metres in 20 years and so is perfect for small spaces. Cascading, pendulous branches are smothered in red foliage in spring, turning deep purple/green in summer and then bronze and gold in the autumn. This easy to grow, attractive small Beech variety will grow in a range of conditions and is easy to fit in practically any sized garden. Exposure isn’t a problem for Fagus sylvatica 'Purpurea Pendula' and it will grow in full sun or partial shade, although full sun gives the very best foliage colour. Just avoid very wet soils. 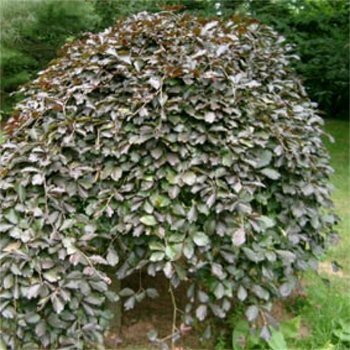 When planting weeping purple beech trees, such as Fagus Sylvatica Purpurea Pendula, it is important to prepare the planting area well. Pot grown beech trees can be planted at any time of the year. You will need to carry out the following to prepare your planting site.